That’s right, folks. 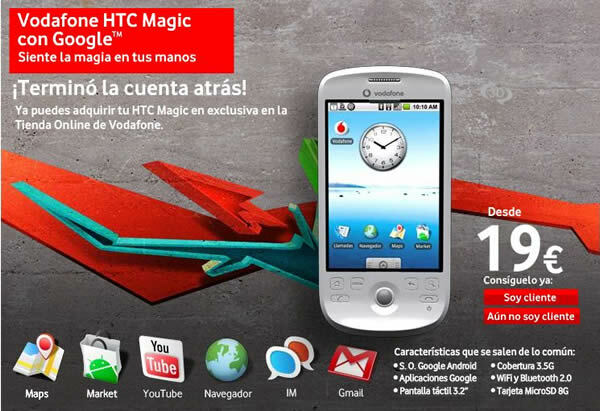 Earlier today, Vodafone Spain officially launched the highly anticipated HTC Magic (con Google, for you Español speaking readers). While it may not be got for free (read: 139€ for the phone on the cheapest plan w/ mandatory 18 month contract) like its UK sibling (expected to launch in early May), the real point is that it is here, now (in Spain at least). I’d have filled the rest of this post with witty Spanish jokes, but that would require me to know more Spanish than “siesta” and “fiesta.” Salud!